Brake pads convert the kinetic energy of the car to thermal energy by friction. Two brake pads are contained in the brake caliper with their friction surfaces facing the rotor. When the brakes are hydraulically applied, the caliper clamps or squeezes the two pads together into the spinning rotor to slow/stop the vehicle. When a brake pad is heated by contact with a rotor, it transfers small amounts of friction material to the disc, turning it dull gray. The brake pad and disc both now with friction material, then "stick" to each other, providing the friction that stops the vehicle. 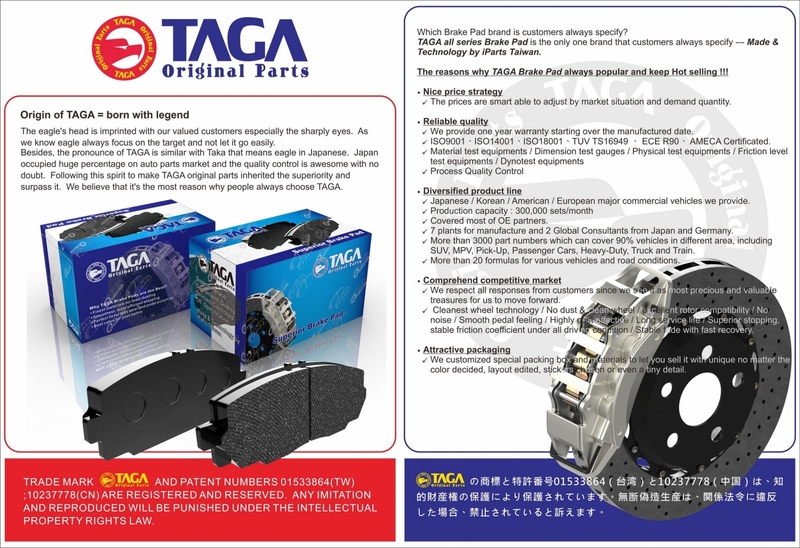 In disc brake applications, there are usually two brake pads per disc rotor, held in place and actuated by a caliper affixed to a wheel hub or suspension upright. Although almost all road-going vehicles have only two brake pads per caliper, racing calipers utilize up to six pads, with varying frictional properties in a staggered pattern for optimum performance. Depending on the properties of the material, disc wear rates may vary. The brake pads must usually be replaced regularly, and most are equipped with a method of alerting the driver when this needs to take place. Some are manufactured with a small central groove whose eventual disappearance through wear indicates that the pad is nearing the end of its service life. Others are made with a thin strip of soft metal in a similar position that when exposed through wear causes the brakes to squeal audibly. Still others have a soft metal tab embedded in the pad material that closes an electric circuit and lights a dashboard warning light when the brake pad gets thin. Disc brakes offer better stopping performance than comparable drum brakes, including resistance to "brake fade" caused by the overheating of brake components, and are able to recover quickly from immersion (wet brakes are less effective). Unlike a drum brake, the disc brake has no self-servo effect—the braking force is always proportional to the pressure placed on the braking pedal or lever—but many disc brake systems have servo assistance to lessen the driver's pedal effort. ◎Non-metallic materials – these are made from a combination of various synthetic substances bonded into a composite, principally in the form of cellulose, aramid, PAN, and sintered glass. They are gentle on rotors, but produce a fair amount of dust and have a short service life. ◎Semi-metallic materials - synthetics mixed with some proportion of flaked metals. These are harder than non-metallic pads, and are more fade-resistant and longer lasting, but at the cost of increased wear to the rotor/ drum which then must be replaced sooner. They also require more force than non-metallic pads in order to generate braking torque. ◎Fully metallic materials - these pads are used only in racing vehicles, and are composed of sintered steel without any synthetic additives. They are very long-lasting, but require even more force to slow a vehicle and are extremely wearing on rotors. They also tend to be very loud. ◎Ceramic materials - Composed of clay and porcelain bonded to copper flakes and filaments, these are a good compromise between the durability of the metal pads and the grip and fade resistance of the synthetic variety. Their principal drawback, however, is that unlike the previous three types and despite the presence of the copper (which has a high thermal conductivity), ceramic pads generally do not dissipate heat well, which can eventually cause the pads or other components of the braking system to warp. However, because the ceramic materials causes the braking sound to be elevated beyond that of human hearing, they are exceptionally quiet.